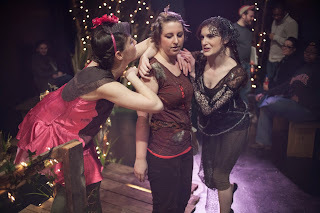 Once upon a time I went to a show and it was called A Midsummer Night's Dream. 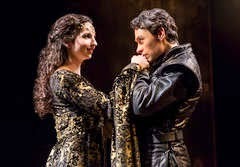 It was directed by Holly Robison and written by William Shakespeare. This Midsummer Night's Dream was set in the 1940s and it was in a very small space. It was also in two rooms and it was sort of in promenade style. The space was too small for the audience and actors to roam freely, but you were in different spaces and you were not in seats but around the actors on the floor or on benches. I thought that all of the actors were good; I wasn't disappointed by any of them. How you interacted with everyone and how you felt like you were in different places when you moved from the castle to the forest made this play delightful. I liked the way they changed one of the lovers' personalities. 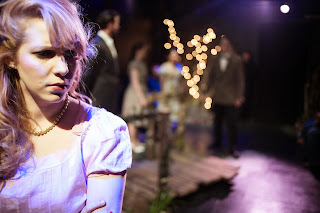 That lover would be Helena (Mary-Kate Arnold). She was different than in other Midsummer Night's Dreams that I have seen. Helena was a drunk. It was a good choice because it shows that she really loves Demetrius (Tim Larson) because she is so upset that he doesn't love her that she becomes a drunk. And it shows that she feels she is not a good person; she always says to Hermia (Letitia Guillaud), "you are so amazing and beautiful and I am not like you. I wish I was" and stuff like that. That seems like a drunk thing to do. It makes it sadder and funnier. It is sad because she is depressed but it is funny because you have this drunk girl walking around the stage saying Shakespearean language in high heels. It is just a hilariously great combination. I thought that everything about the fairies was very interesting. Like I thought it was interesting that the fairies guided you basically to the theater to start the part in the woods. I thought that all the fairies' costumes (By Carrie Campana) were like modern fairies and not like Shakespearean. I liked that because it added to how it was supposed to be set in the future from when it was written. I do think Puck's (Julia Rigby) costume could have been a little bit more abstract and crazy. It was very normal. I really liked Titania's (Caitlin Jackson) costume because it really brought out the modernism and beauty of this character. I thought that Peaseblossom (Naomi Lindh) and Cobweb (Miona Lee) were hilarious. I loved how they were like, "Seriously? Bottom (Michael Houghton Wagman) is here?" in a very ticked-off manner. I thought that the players were hilarious. The ending show was funny because it was just so horrible. I loved the dying scenes with Bottom as Pyramus and Flute (Naomi Lindh) as Thisbe. I thought it was funny because all the actors were great at being bad. When Pyramus stabbed himself, it was so unconvincing that it was hilarious. It was so bad that it was good. I also loved how Quince (Maria Burnham) was doing movements like, "Now leave!" and mouthing it. I thought it was cool when the people on stage would ask you to come up and dance and you got to dance with them. That made you feel like you were actually in the show more and more as the show went on. I thought it was really cool how Puck seemed to be in disguise as the actor who played Moonshine. After everyone had gone to bed he stayed and took off his hat and became Puck and did the ending speech. I thought that was a great way to end, like "That's who it has been all along!" People who would like this show are people who like big fairy reveals, hilariously bad plays about Pyramus and Thisbe, and drunk Helenas. I'm sorry that I did not get to see this show before the day before closing; I think they should do a remount! It is the first thing I have seen by this theater company and I would definitely go back. I was really impressed. 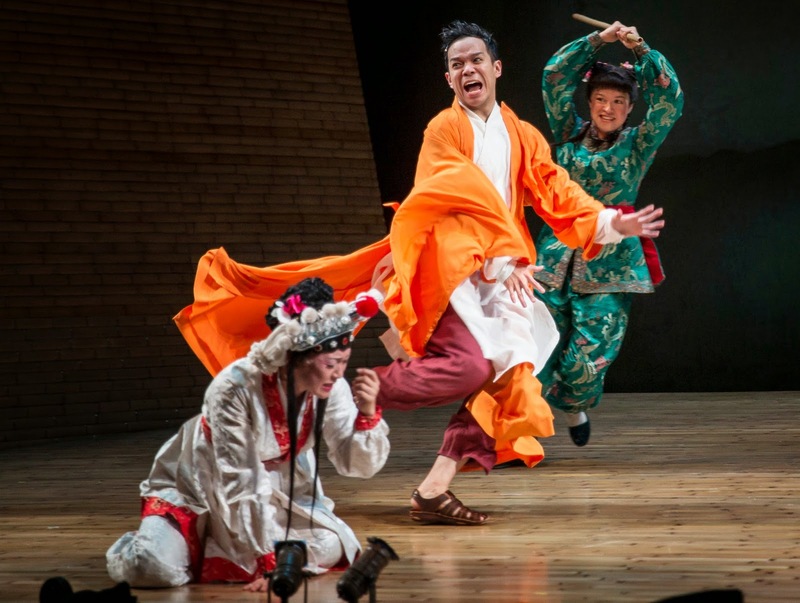 Ada Grey's Summer Theater Picks on WBEZ's Morning Shift. I can't believe it! I was on WBEZ! I loved talking with Jason Marck, Don Hall, and Sarah Ballema, and I hope you have fun listening to it! 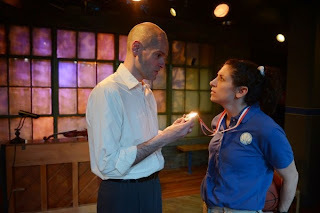 And watch for my review of Monstrous Regiment at Lifeline Theatre in June. 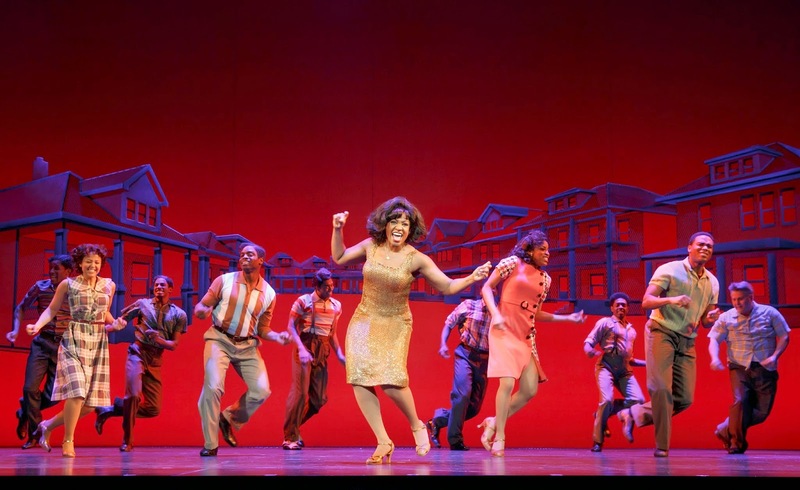 Once upon a time I went to a show and it was called Motown: The Musical. It was by Berry Gordy and it was directed by Charles Randolph-Wright. The music is Motown music. 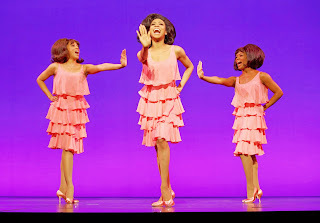 It is about a man named Berry Gordy (Clifton Oliver) who falls in love with a girl named Diana Ross (Allison Semmes). It is about how Motown Records was started by Berry Gordy listening with his parents to Joe Louis winning a boxing match against Nazi Germany. And he knew he wanted to do something for the community. So he got a bunch of people to sing Motown music with his friends Smokey Robinson (Nicholas Christopher) and Marvin Gaye (Jarran Muse). Then he met Diana Ross and he called her big eyes. It is also about how Motown Records changed. I really liked this show. I was smiling the entire time because I recognized and loved all of the music and all of the performers were great. Afterwards, my cheeks hurt because I had been smiling so much! I thought that the Temptations (Lynorris Evans, Robert Hartwell, Marq Moss, Ramone Owens, Rod Harrelson) and the Four Tops (Grasan Kingsberry, Rashad Naylor, Christian Dante White, Elijah Ahmad Lewis) at the beginning of the show were awesome. It made you want to dance, so that made you know what this show was going to be like. You were going to want to dance through the whole show. Each group was trying to sing one of their songs while the other was trying to do one of their songs, but like a competition. It was there to show that maybe they didn't like each other very much back in the day because they were basically competing to see who was better. But I think they were doing that just for television because afterward they were chatting and laughing like good friends. I thought that the Jackson 5 (Leon Outlaw, Jr., Rod Harrelson, Rashad Naylor, Robert Hartwell, Lynnoris Evans) were all amazing. I thought that Michael Jackson (Outlaw) was great. He was one the best kid singers I have ever heard in my life. He seemed so happy while he was singing. He just seemed like he was so alive singing "ABC" on stage. He made the audience clap so hard to the song "ABC." It was just amazing. I really liked their outfits (costumes by Esosa). They were crazy awesome. Diana Ross seemed like such a sweetheart. She sounded exactly like I wanted Diana Ross to sound. She was a beautiful singer and I think she sounded just like her. One of my favorite parts was when she sang "Reach Out and Touch" which I thought sounded beautiful. I don't know if it is true every night, but, the night I was there, when she asked people in the audience to come up and sing, all of them sang beautifully. Then she told everyone in the audience to sing along and hold hands with the person next to them, even if they didn't know them. And we all swung hands as we sang. The audience loved it because it was like being at a Diana Ross concert. 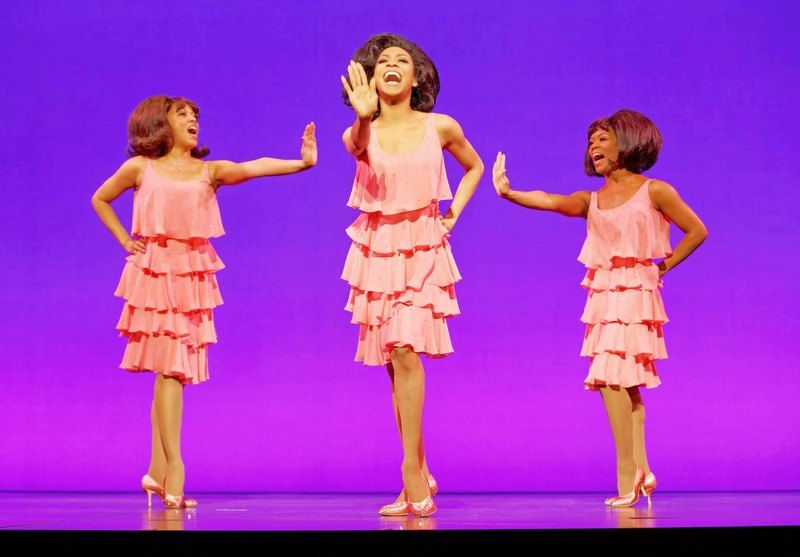 I also really liked when Diana Ross sang "Stop in the Name of Love" with Mary Wilson (Trisha Jeffrey) and Florence Ballard (Krisha Marcano). I liked the dancing a lot because it was so sassy. I memorized the dance (choreography by Patricia Wilcox and Warren Adams) because I liked it so much. My favorite move was the twirling snaps! Berry Gordy I think seems like a very nice guy but he is kind of clueless. Like he's clueless when Diana leaves for another company, and he doesn't really seem very sad. Diana has to make a choice between what is professional and what is personal. And she chooses what is professional, but I think she should have chosen the personal and stayed with Motown. And also, when he tries to sell Motown, he doesn't know that would be bad. Good thing he doesn't do it! You like him anyway because he's such a nice guy and he is trying to make this world a better place…if he can. And he can! He makes the world a better place by making Motown music possible. People who would like this show are people who like amazing singers, wanting to get up and dance, and twirling snaps. I think people should definitely go and see this show. I had so much fun seeing it, and I think everyone would! Once upon a time I went to a show and it was called The White Snake. It was written and directed by Mary Zimmerman and it was based on a classic Chinese fable. It was about two magical snakes, a white snake (Amy Kim Waschke) and a green snake (Tanya Thai McBride) who decide to go into the human world. When they got there, the white snake turned into Lady Bai and the green snake turned into Greenie. 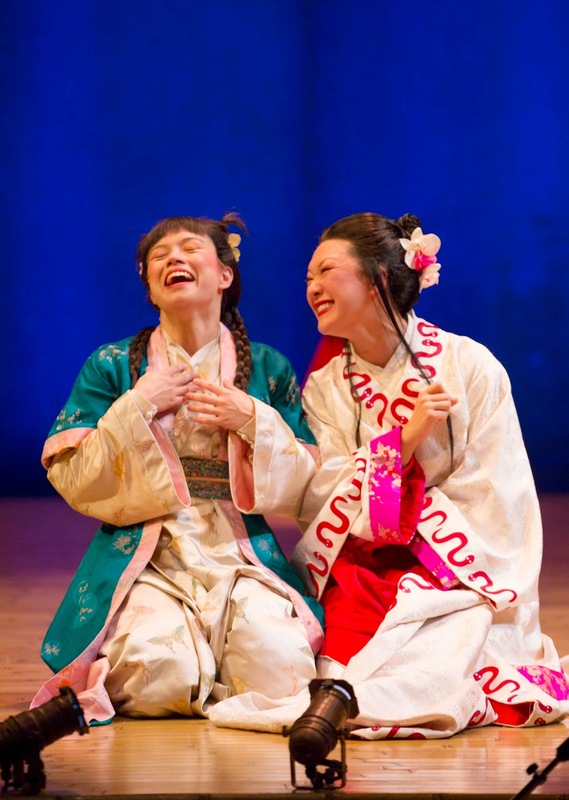 The white snake fell in love with a pharmacist named Xu Xian (Jon Norman Schneider). But her problem is she is a magical snake, like a good demon, but she is in love with a human. But they get married and then a little later a monk named Fa Hai (Matt DeCaro) tells the pharmacist that his wife is a demon. Problems arise! I think that this is a very good show. The puppets and costumes are awesome and the acting is also great. The special effects and lighting were exciting. I thought that the look of the play was captivating. 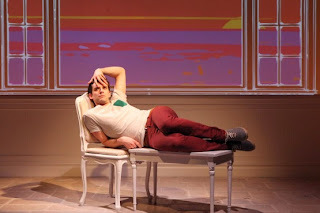 I liked the set pieces (by Daniel Ostling). I thought that it was really cool how they had these drawers which opened up into a big door which was their bedroom. There were different sizes of the chest of drawers which had different medicines in them for their medicine shop which Lady Bai and her husband owned. When it started raining, these long silks came down from the top of the theater and made it look like it was raining. I also really liked the projections (by Shawn Sagady). One of my favorites was when the monk house was being flooded and then there were crabs and fish swimming through the water behind. I also really liked the lanterns and how many different kinds there were and how many different colors. It kind of made an effect of a moon. I liked how the parasols made the white snake but it had a little red tie at the end for a tongue. They also used parasols as parasols and they also used parasols to represent a house; they represented the pagoda and the white snake's house that way. I thought the costumes (Mara Blumenfeld) and the puppets were awesome. I loved the big snake puppet that came out of the bed. I also really liked the little snake puppets, the white snake and the green snake puppets. I also really liked all the kimonos. You don't want them to look like clown suits, you want them to look like actual kimonos you could buy in China. They looked beautiful. But my favorite was when they combined the puppets and the costumes and made The Crane's (Emily Sophia Knapp) suit, which was basically a white outfit with a white wig that went over the eyes and the nose and then it had a giant crane head. I thought it was amazing looking. I think it might have been one of my favorite costumes ever. I think that Greenie and Lady Bai are the best of friends. I liked that aspect, that there was a servant that they didn't treat like a servant. You knew they were such good friends because when they saw each other on the mountain, Greenie wanted to go with the white snake to the human's world. They are very different because Lady Bai is very skilled and very patient and the other one knows some tricks and is very impatient. You liked both of them because Greenie is kind of like the comic relief. I thought that she was funny because seeing a snake that is impatient is just hilarious. She is also very nice and kind and she also was very enthusiastic about everything. And she was also very good a proposing marriage for someone! I really liked the villain Fa Hai even though he was evil. He was telling the truth that Lady Bai was a demon. But she was not an evil demon and she was not going to try to kill her husband, so he was wrong about that. I also liked how evil he was and how sinister because it makes for a very good story. I also really liked his accomplice who turns into his ex-accomplice. That was a cute little monk (Eliza Shin) who was trying to make Xu Xian happier about being forced to be a monk. But then she said, "I don't really think it is fair that he forced you to be a monk," and then she helped him escape. I liked both of these monks very much, and I thought they did a great job acting evil and cute. People who would like this show are people who like magical pharmacies, impatient green snakes, and giant snakes in your bed--go and check right now! Are you back? Any snakes there? The point of the show was to tell you that you are never alone, and even if someone is gone forever they are still around. And when you love someone, your love could last forever. I think this show should be for ages 6 and up because a five-year-old kid might get sad about all the talk of death. People should definitely go see this show. I loved it! The acting is amazing; the puppets are amazing; everything is amazing! Once upon a time I went to a show and it was called Charles Ives Take Me Home. It was by Jessica Dickey and it was directed by Keira Fromm. It was about a man named John Starr (David Belden) and his daughter Laura (Stephanie Chavara) who wanted nothing more than to play basketball. And she is getting older and older and Charles Ives (Jamie Vann) is leading them on, so basically they don't kill each other because John doesn't like basketball, he likes music. Charles Ives likes music and sports. It is about fathers, daughters, love, and music and basketball. It is saying that all of these have their faults, but there are good things about them. I remember that Charles Ives was talking in the show about how value and importance are not the same thing. The father and the daughter are both. Basketball and music are valuable, but they are not super important. Some people need them to live, but some people can live without them. I really liked this show and I think it tied together very well. The lesson of the show is to be open to other people's passions. And it makes me not want to fight with my dad ever again. I think this show is very funny but also very sad sometimes. I thought it was really funny how John Starr played for a second, then he talked, then he played, then he talked. And he kept mentioning the college he went to. "I went to Juilliard." Then he played. Then he talked a little bit about women's private parts. And then he went back to playing. Then he talked about his daughter. Then he went back to playing. This showed you that he liked music but he also liked to chat. So he decided to make music-chatting. I also really liked when Laura started bouncing her basketball to the rhythm of her father's music. I also liked how shocked her father looked when she said she looked up about Charles Ives and read his book and listened to his music. I just loved that expression so much. Basically that was my father's expression when I said Batman was one of my favorite super heroes. It is also sad because Laura has to live with her mother and she doesn't really seem to like her mother very much. There is another thing that is pretty sad, but I can't talk about it because it is one of the last things that happened in the play. I think that basketball and music are a very big part of this show. Sometimes there is basketball music! Something I know about Charles Ives is that his music is very mixed up. My violin teacher, Geoff, told me to play one song while he played another to show me what Charles Ives' music was like, like two songs being played at the same time. I think they chose for this to be about Charles Ives because the father and daughter's relationship is very mixed up. They like two things (violin and basketball) that don't seem to go together, but they still work. I don't play basketball but I do play music. But you kind of shift sides as the play goes on, from violin to basketball and basketball to violin and back and forth. If you see this show, you will not be able to decide which is better. I personally like violin better, but my uncle I think would like basketball better. It is literally your opinion. And there is no better one of the two; they both have their rights and they both have their wrongs. I liked the direct address in this because it was like John and Laura were also talking to Charles Ives. And Charles Ives also talked to us, but he was kind of like a ghost. The ghost was talking to us. If you don't know he is Charles Ives when he comes out, you think he is the narrator. And he kind of is. He is Charles Ives but Charles Ives is the narrator. You do like Charles Ives even though he is a crazy lunatic. He is crazy in a good way--kind of like me. He talks crazy--like in music class he starts talking about sports. He's like, "When your father dies, the trees bend down." That could be true, but it is kind of crazy. He is the voice of music and sports. He is like both of them put together: the violin and the sports. He is the voice of what the father should be and what the daughter should be. The father and the daughter love each other, but they have a lot of fights. My family doesn't have a lot of fights, but we fight. These fights did seem realistic because if your dad is working and you disturb him he can get angry. My dad is not at all like that dad, but it just seems realistic. I think that it must be very hard for her to have a mom and dad that don't live in the same house and don't love each other. And it is also hard for your family to like such different things and you are the weird one. That is not like my family. All of us like theater; all of us like writing; all of us like books. Except my dad does not like Restaurant Impossible because he thinks it looks too planned. The father and daughter relationship made me feel emotional because it seemed very realistic and it showed me what should not happen when I become a teenager. People who would like this show are people who like Charles Ives, basketball, and music-chatting. People should definitely go and see this show. I think it is funny, sad, and bittersweet. This show will help people who are having fights with their families be a family again and not just be fighting. I loved this show very much and I think it is awesome. Once upon a time I went to a show and it was called Buyer & Cellar. It was directed by Stephen Brackett and it was by Jonathan Tolins. It was about a guy named Alex More (Michael Urie) who worked for Barbra Streisand in her mall, which was in her basement, which no one but her and her husband came to. Barbra Streisand and Alex were becoming great friends, but Alex's boyfriend did not like that because he thought that she was stealing him. And he thought that Barbra Streisand was selfish, but Alex was defending her because he thought she was his friend. It is about friendship between a movie star and a regular guy, how rich people can be nice or they can be jerks, and frozen yogurt. I think that this was a really funny show and I liked how there was only one person in it because you got to see a lot of characters played by one person and see that person's abilities. I thought that the set (by Andrew Boyce) was really cool. I like how it seemed like one tiny little house. And I liked the projection screen (projection design by Alex Koch) in the back to show where you were, like if you were in the doll shop, or if you were outside, or if you were in the main house, or at the boyfriend's home. I think they made the set feel small so then it would feel more like storefront theater and less like Broadway. It made you feel more like you were actually in the show. I was worried at the beginning that it was just going to be the actor talking and making fun of the book My Passion for Design, which is Barbra Streisand's book about the house. I loved the actor, but I thought if that was the entire play that he would be the only good thing about it. But then it got rolling and he said, and here is a story about a guy named Alex who works with Barbra Streisand. And then they really started the story. Then he turned into Alex. And then he would turn into other characters, and I really liked that because there would be scenes where he was one character and then the other and then went back and forth. It sometimes could get really funny because he was switching back and forth so fast and he was switching personalities so quickly. It was also kind of amazing that he could actually do that. The doll scene I thought was very funny because this was the first time Alex met Barbra Streisand. She came in and she wanted to place a doll on hold, the one that blows bubbles on a pipe and plays weird music. And she asked "What's her story?" in this questioning queen-like manner. Then he made up this tragic backstory of these girls in World War II whose father entertained them by making this doll while they hid from the Nazis but then the mother died and they kept the doll and one of the two girls went crazy and had to go to an insane asylum and the other one turned out to be lesbian and gave the doll away for other people's happiness. It was a very strange story and it was hilarious because it made no sense basically. Then she was like, "Oh, what a sad story. Can you put it on hold?" And then he said, "What name should I put it under?" and it was so clever that he said that. And then she said, "Oh. Um. Sadie" in a queen-like manner. That is great because she completely made up this name and then just left immediately. Their relationship is him trying to look clever and her trying to say, "You're not so clever." They are kind of having fun in this contest, but at the end when he asks her name, she just gets so frightened, it is hilarious. I thought that the frozen yogurt scenes were hilarious. I liked both of them. I liked how in the first one when Alex got the frozen yogurt ready and when he gave it to Barbra she started making extraneous "murrrr this is soo good" noises. And going like "oh!" and pointing at it with a spoon a going like "Yeah. This is delicious." Then when her husband came down about 5 minutes later in the play but about 4 hours later in his world and asked for the same thing that Barbra had gotten, and once Alex gave it to James Brolin he did not eat it and I don't think he ever did. I think that his wife just asked him to go down there to see if Alex put on the rainbow sprinkles correctly now like she showed him when she came down and actually put on the rainbow sprinkles herself because she was so disgusted with how he did it. I loved how he did the James Brolin character. He was hilarious because he was so gruff and tough. I thought all the Gypsy stuff was hilarious. Like when he started crying when he was singing "Here's your hat…" and he dips Barbra back and then he is her for a second and she says, "Is something wrong?" That was funny because they were doing Gypsy and he just literally started crying in the middle of a song and because it takes until almost the end until Barbra notices that he is bawling. Gypsy kind of reminded me of this, only Herbie was Barbra Streisand because he is the one who let the other person down by not being their friend. Gypsy is about a mom who doesn't know how to be a good mother and likes to push on people. 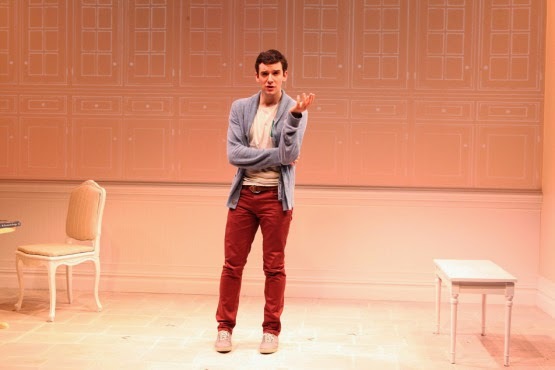 Buyer & Cellar is also about things going wrong because of pushy people. This was not all a funny play. There were some sad parts too, like when he breaks up with his boyfriend. And how in this show Barbra is a weird old lady who likes dolls and to play dress up. (But I don't know what she is really like. She might be a complete sweetheart for all I know.) I thought that the end was touching because he found out that the rug he had bought was too short and he returned it and he said it felt good. So Barbra Streisand had influenced him to be a more demanding person. To be demanding can be a good thing. When you ask for something that you want and pay good money for it, and it is wrong, you can send it back. It is good to be demanding about art. You should demand that everything is the way that you want it to be to move or to make people realize or to make people happy. That is another good reason to be demanding. People who would like this show are people who like bubble-blowing dolls, hilarious tragic backstories, and laughing your face off. I think that people would have a lot of fun at this show because it is funny, touching, and the actor is amazing. It makes you think about friendship and about what it would be like to be famous and about frozen yogurt. This show makes you really want frozen yogurt and it is a good thing there is frozen yogurt in the building next door. 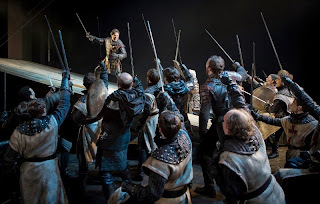 Once upon a time I went to a show and it was called Henry V. It was written by William Shakespeare and it was directed by Christopher Luscombe. It was about Henry the Fifth (Harry Judge) and Britain was at war with France. There are these drunkards, basically: Bardolph (Bret Tuomi), Pistol (Greg Vinkler), and Nym (Larry Neumann Jr.). They join the war not for fame but just to steal stuff from the French and the English. These people are Falstaff's friends, but Falstaff has just died. And they used to be Henry the Fifth's friends but they stopped hanging out when he became king. This play is about responsibility and learning how to take responsibility. 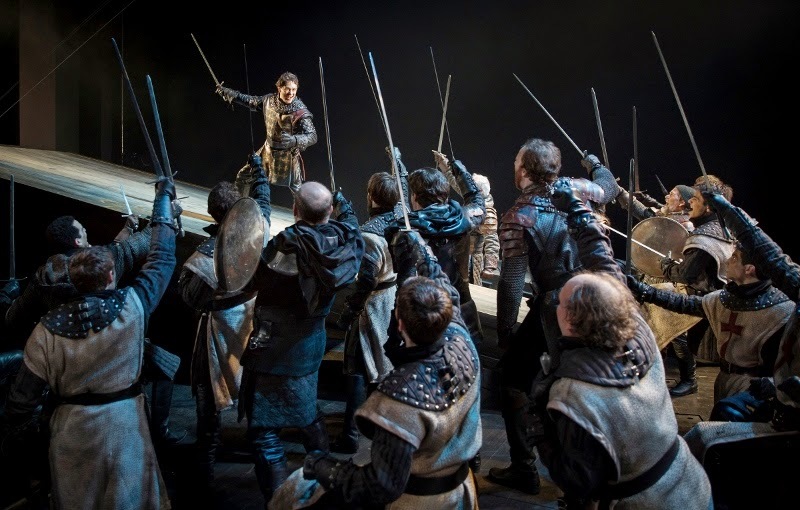 I think that Shakespeare was glad that the war happened because he felt like the French sucked and they deserved what they got. He thinks that the English are like awesome. I don't really understand any kind of war, but I don't even think they should have had this war. I think the British should have just left them alone. I liked this play. This is the first time I have seen this play. I thought it was going to be just blood and guts all over the stage, but it wasn't. There was comedy too. Henry was very nice to all of the soldiers (you could tell that by how he went to every soldier and talked to them about the battle and their family and stuff like that) and that is a good thing about him, but what was not a good thing about him was how he fought a war; he did not show any mercy to the other side, not at all, until after they'd already done the horrible thing to the other side. Then he said; "Oh my gosh, I'm so sorry." He is a good king for the British, and he is fair, and I like that about him. I think that he is fair because of how he doesn't pick favorites. When his old drinking buddies rob a church he's not like, "Oh no, these are my friends, don't hurt them." He is like, "You robbed a church; you should be killed." I don't agree about the killing part, but back then that was how you were punished. That was basically like jail back then. He is also fair because he takes the word of people and uses it to be even fairer in a sneakier way. It is fair to be sneaky in this case because they are trying to kill him basically. There are these three conspirators and their names are Scroop (Demetrios Troy), Cambridge (Nicholas Harazin), and Grey (Cody Proctor). And Henry hangs them for being traitors because they were spying for the French. They told him to be hard on other people, so he was hard on them. That is a case where I thought he was a really clever person. I thought that the Princess Katherine (Laura Rook) did a great job with her French. I really thought that she was French until close to the end when she spoke perfect English as the narrator, but even then I thought she might really be French. I loved the scene where Alice (Sally Wingert), the princess's nanny, was trying to teach her English, but not really succeeding. The part where she said the F-word because her teacher didn't really know how to pronounce foot, was hilarious. I also really liked it when instead of saying the nails, she said niles. And how the elbow the nanny pronounced as d'elbow and the princess pronounced it as bilbow, but then she pronounced it as elbow, but the nanny was like, "d'elbow." Now they are showing that the French are kind of dumb, and I don't really like that. But I liked the scene because I found it very funny. I thought that the scene where Katherine and Henry met was actually I thought a weird scene because of the way he chose his wife. He wanted to marry her at first so he could rule France but then he saw how beautiful she was and was like "Now it is a double score." I thought that method for choosing a wife wasn't very good. But I still wanted them to be happy and not be super angry at each other all the time because it was basically an arranged marriage. I thought the three drunk robbers-- Pistol, Nym, and Bardolph--were very funny because they were very stupid and the Boy (Kevin Quinn) thought they were stupid too. He was actually smarter than them even though he was only a kid. I liked the story between Pistol and the Hostess (Sally Wingert) and Nym. It was basically like Nym was so much in love with her, but she was already married. And the Hostess seemed like she was happy with the husband she had and wouldn't want a guy who just said "No more!" randomly. I thought that Bardolph seemed like the nicest of all of them, because he just wants to bring everyone together. Pistol is the only one of the friends who actually lives. I think he gets to live because he didn't do the crime, but he is still a bad guy because he is like, "Hey, I am going to kill you if you don't give me this amount of money." Good thing it wasn't just a random guy. It was a guy who was fighting against them, so it wasn't super bad. I thought that the Dauphin was an awesome character. If you don't know what a Dauphin is, you can learn it from me...Ada Grey! The Dauphin is the French prince. I loved how the Dauphin was talking to his friends about his horse and how he said, "his neigh is like the bidding of a monarch" and he walked off all like he was saying "Boom!" I think that was just the funniest thing ever. I loved that. And it seemed like the Dauphin had a good sense of humor because he sent the English tennis balls and said that they were a rare treasure. It is taken as a big insult, because I think it was a big insult, but it was still funny. I thought it was really funny when the Dauphin and his friends came out in solid gold armor and then after that then the British come out in really drab and dark outfits. That shows the difference between them: the French seem to be so much winning, but then they don't at all. I loved the costumes (by Mariann S. Verheyen). I thought they all seemed very Middle Ages-y. I liked Princess Katherine's second dress. I think it was very pretty and I want that dress. I liked the pattern a lot and I liked the green because one of my favorite colors is green. I also thought the golden armor was awesome. It seemed like solid gold. I thought the set (by Kevin Depinet) was amazing. I loved when the wall fell down and turned into basically a big battlefield. I thought that all the fight choreography (by Matt Hawkins) was amazing. I felt like the battle was really going on and that it wasn't just a bunch of actors. When they killed the boys that were guarding all the luggage, I felt like, just seriously leave a sword with them or something. A sword, or something to defend them, like a pointed stick. Or someone in the world to guard them, like maybe a mother or something. Or a father. I think both the English and French did something really horrible. One of them killed kids and the other one forgot to leave anyone with the kids. People who would like this show are people who like crazy funny drunkards, walls that turn into awesome battlefields, and double scores with princesses. People should go and see this show because it is funny, some of the actors are amazing, the fights make you feel like you are actually in the battles, and the costume and sets are amazing. 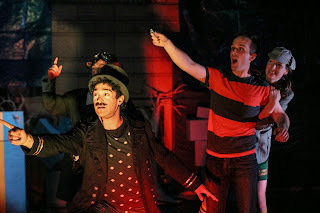 Once upon a time I went to a show and it was called Tollbooth: A Clown Show. It was directed and devised by Will Bishop and Scott Ray Merchant. It was about Shiloh (Kyle Geissler) who was a young man who, on his birthday connected these two cords and basically these clowns started popping out everywhere and moving things and telling him this story about Wisdom and Whimsy, who were two princesses who had been banished by their two brothers, one who ruled numbers (Kate Healy) and one who ruled letters (Shaw Nigro). And then on his adventure he met really great friends, including a dog named Minnie (Angelica Roque) and a grumpy man named Balderstache (Tim Martin). It is based on The Phantom Tollbooth, so if you like The Phantom Tollbooth you would probably like this. I liked this show and I thought the puppets were really awesome. The puppets (by Dav Yendler, Grace Needleman, Evan Garrett, Myra Su, Cara Feeney, and Ellie Terrell) I thought were very nice. I liked the Dodecahedron (Alexander Knapp), because it had so many faces and it just flipped around now and then. I liked how Shiloh was not only an actor but also a puppet. I think they chose to do that so he could really interact with the smaller puppets without it looking weird. But he was also an actor so then he could act with the bigger puppets as well. Speaking of the big puppets, I really liked the ending puppet. I thought it was very satisfactory. It was the perfect place to end at, and you weren’t expecting it. I’m not being more specific because I want this to be a surprise to you. But, also, watch out for a lobster claw! This show was at a fieldhouse at a park, where a lot of kids' birthday parties are. I thought that was really cool because at the beginning the show was set at a birthday party. They created that atmosphere by having birthday party crafts and presents and other party-like stuff. I liked how it seemed very kid-friendly while most shows that are parodies of children's books sometimes aren't. I liked how they really embraced clowning and they didn't just call it Tollbooth: A Clown Show. I liked their outfits, they really reminded me of clowns--not circus clowns, like clowns who were kids. They reminded me of clowns because they went crazy, wore kneepads everywhere, and were noisy. Clowns are mostly funny. They can also be terrifying, but these were anything but terrifying. I would call them cute. They had clownish makeup which I thought made the clown aspect more clear. I liked when Shiloh was running up the infinity staircase. I found that very cool because the stairs kept switching around kind of in circles now and then. That made you feel like you were actually going up the infinity staircase. 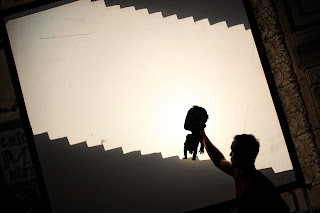 They used shadow puppets for the infinity staircase but had Shilo just as a tiny actual puppet on the outside. I thought the dog Minnie, was very cool. It used to be Tock, but now it is Minnie which is short for minute. I liked how they switched the gender from male to female, because they did not have enough female characters in The Phantom Tollbooth, I thought. I really liked Minnie's puppeteer because they both basically had the same hat and I think Minnie is awesome. I think that it would have been a little bit better if they had just done The Phantom Tollbooth instead of doing a little bit of a spin off it. They were trying to recreate the story as their own but it seemed like they just changed the names and left most of the rest the same. Parody points outs and fixes flaws or makes fun, but this time they weren't doing either. They were just doing a spinoff. I was glad they weren't making fun of it because that is what I didn't want. I did want them to change more than the names and a little bit of the plot or just go ahead and do The Phantom Tollbooth. I liked the things that were changed; I just wanted more of them. People who would like this show are people who like watchdogs, infinity staircases, and awesome puppets. I think this show should be for ages 3 and up because it is not too scary but I don't think a 2-year-old could really handle it. People should see this show because it is funny, the puppets are great, and it has a great atmosphere. Once upon a time I went to a show and it was called Lay Me Down Softly. It was directed by Kevin Christopher Fox and it was written Billy Roche. It was about a man named Theo (Jeff Christian) who owned a little boxing ring who had a daughter named Emer (Jamie L. Young) who fell in love with Junior (Dan Waller) who is basically an ex-boxer who is a mechanic. But one day when their boxer Dean (Matthew Isler) gets too beat up, Junior has to take over. Theo's girlfriend Lily (Carolyn Klein) doesn't really like Emer, unlike his friend Peadar (Michael Grant) who treats Emer like a daughter. Problems arise with love, jerkiness, and money. The play is about love and tough decisions and learning to accept what you have already done. I really liked this play. It is very funny and it is a mind-puzzler. 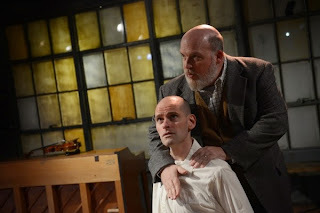 And by the time I had thought over it for a while I thought I could figure out most of the play and I came up with a lot of theories about fathers and love. Three things really made you feel like you were really there in the play and not just like you were watching a show. It thought that it was cool how Lily actually ate ice cream because you never actually expect real ice cream to be on stage. You might expect a real glass of water on stage, but this was different and it made me feel like I was present at this time and seeing this happen. It was not like, "Oh. Why is she licking plastic?" I thought that the set was awesome because it really looked like a traveling boxing ring. I liked the sign out front above the door that said "All Comers" and how they mentioned it in the show. The place looked like it was not completely run-down; it still had some business, but it was not in great shape. I thought that all the accents (dialect design by Eva Breneman) were really convincing and I really liked them. They really didn't seem fake. If I hadn't heard some of these actors talk before I would have thought they were really from Ireland. There is a lot of romance in this. There is Junior and Emer, Lily and Theo, Peadar and Emer's mom, Theo and Emer's mom, Paddy Hickey the bookie and Lily, Paddy Hickey the bookie and the fortune teller, Ernie and the fortune teller, and Rusty and Lily. Most people are in love with more than one person. And you never see Paddy Hickey or Ernie or Rusty or the fortune teller or the mom. Once you meet Dean you know that he wants a girlfriend desperately but you also see that he is not going to get one anytime soon because he is such a jerk. He is laughing at everything kind of like a hyena and he thinks people getting hurt is the most funny thing ever until he has a fight and it doesn't really turn out as planned. The best relationship is Junior and Emer; there is no other man or other woman or anything like that. Lily has an actual relationship with Theo, but maybe that is the only one that she has an actual relationship with. The other relationships are mostly just flirty. The relationship between Emer's mother and Peadar was that he liked her but he came and got her to help her after Theo had left her and he came and was like I'm not going to leave her, but then he left her, and he felt sad about that now but he couldn't do anything about that. The author thinks love can be good in some ways but sometimes it can just go haywire. 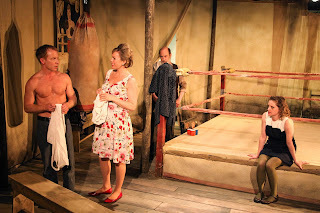 Family love in this play is not exactly love. It is not hatred, but it is not exactly love. And the leader of the family, which is the father Theo in this case, is not giving his family the amount of love that they need. The family is kind of falling apart because Theo is not treating Emer like a daughter. He is treating her more like a servant. And he treats Lily the same way as he treats his child, basically like a servant. Peadar and Junior and Emer are basically like a family even though they are not actually family. This shows us better family love. Any they might be a family or soon to be a family. (You will know what I mean after you see the show.) Peadar is more like a father than Theo because he actually treats Emer like he loves her instead of like a worker. And Peadar wants Junior to be happy and if you actually love someone you want them to be happy even if it isn't the best for you. I think that the writer thinks that friend love can be turned into family love by being motherly or fatherly or brotherly or sisterly. 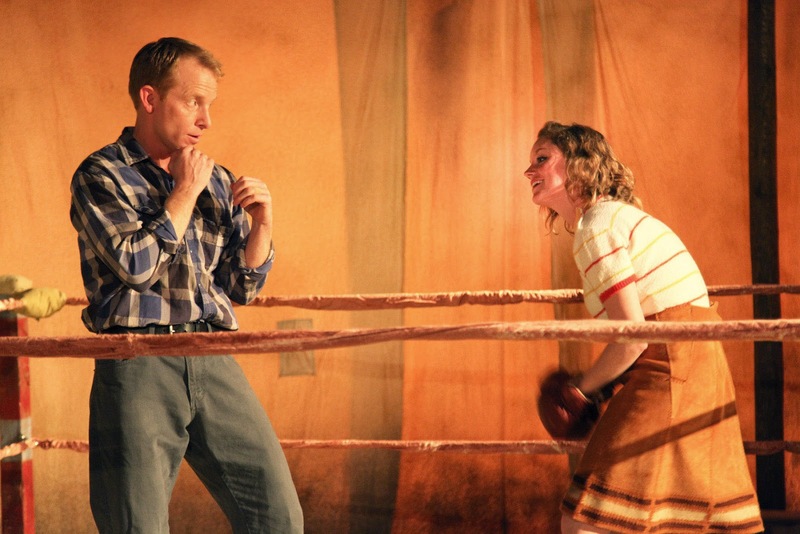 Boxing I think represents love in this show. It represents love in the way that there is a scene how you really see that Emer loves Junior is that they have a playful boxing fight. And how you really know that she loves him is that they basically make out in the boxing ring too. It doesn't just work with romantic love. It also works with family love. You see the family-ish love in boxing when Peadar is coaching Junior and he is not being tough or very serious. He seems like he doesn't want him to get hurt and that is why he is doing this. Love can also be a hard thing because Lily and Emer's mom are not treated like they should be. The actual boxing where people actually get hurt shows us the hard side of love. People who would like this show are people who like boxing, love, and ice cream. People should definitely go and see this show. I loved it a lot. It involves you in the story and it doesn't just feel like you are watching a play. It feels like you are actually there.